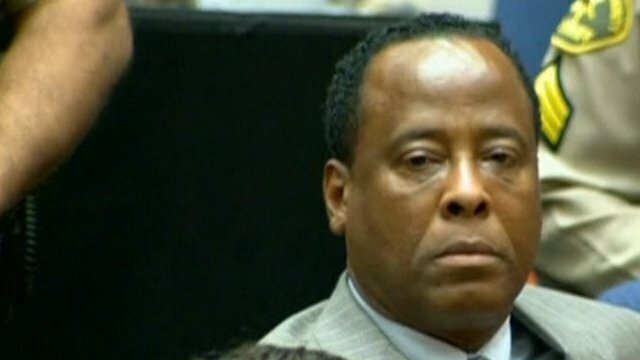 Dr Conrad Murray (photo, from bbcimg.co.uk), Michael Jackson’s personal physician has been found guilty of involuntary manslaughter by a jury in Los Angeles. Dr Murray, 58, did not testify during the trial. He had pleaded not guilty to giving a fatal dose of propofol, a powerful anesthetic, to the singer. Michael Jackson, 50, died on June 25, 2009 from an overdose of propofol. After a six-week trial, a panel of seven men and five women deliberated on Friday and through the morning on Monday to reach a unanimous verdict. The judge will announce Dr Murray’s sentence on November 29. Until then the doctor was remanded in custody without bail because of his ties outside the state of California which could help him leave, said the judge. Dr Murray could receive a maximum prison term of four years and lose his licence to practise medicine. As the verdict was read out, Dr Murray, who sat silently in court, shifted slightly in his seat. Also in the courtroom, the Jackson family was weeping quietly. The family was overjoyed at the verdict, LaToya Jackson told the Associated Press news agency. “Michael was looking over us,” she said. Fans of Michael Jackson had gathered outside the court and were cheering and chanting, “Guilty! Guilty!” before the announcement of the verdict. When he died, Michael Jackson was weeks away from beginning a series of concerts in London. Once they arrived at the singer’s house, paramedics tried to revive him and rushed his body to a hospital where he was pronounced dead. The autopsy then revealed that he died from an overdose of sedatives and propofol, which is normally used in surgery. Although there is no law against administering propofol, the prosecution argued that Dr Murray was grossly negligent for administering it in a home setting and without proper monitoring equipment. They also said he delayed calling emergency services and failed to informing medical personnel that he gave propofol to Mr Jackson. Dr Murray’s defence said he had given a small dose of propofol to the singer in order to help him sleep and claimed that Mr Jackson was dependent on the drug, adding that he likely delivered the fatal dose to himself when his personal doctor was out of the room. During the trial each side called their own expert witness on the anaesthetic drug. 49 witnesses and more than 300 pieces of evidence were presented to the court. The most shocking moments during the trial were when the jury heard a recording of Michael Jackson speaking about his upcoming concert series, but the singer sounded incoherent and slurred. The jury also viewed a photo of a lifeless Mr Jackson on a gurney.